Finely crafted in the USA from North American Hardwoods, sanded, ready to finish in either stain or paint. Custom Species Available. 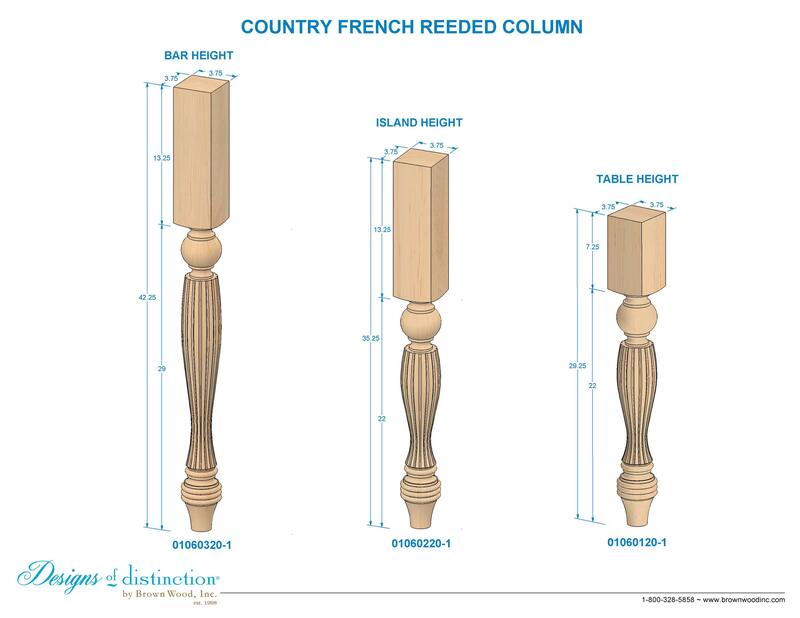 Modify the length, look, and application of your Reeded Country French Column by choosing one or more Add-Ons below. Trimmable 3.75" x 7.25" top block. Product is cut at an angle from corner to corner, full length only. Custom cut product is not returnable. Split your column in half. 1/8" of thickness may be lost due to saw kerf. Both halves will be sent with order. Split product is not returnable. Looking to wrap your column around your cabinetry? Stop notch cutting is the answer. Let us know how far down to notch the product to wrap around your cabinetry. Stop notch form will be forwarded with sales order acknowledgement. Custom notched product is not returnable. Looking to create a pie shaped piece to fit into a 90 degree corner? Quarter notching is the answer. Quarter notching creates a single quartered piece and a single 3/4 piece. Both parts will be sent. Quarter notching form will be forwarded with sales order acknowledgement. Quarter notched product is not returnable. Add an electrical box to your column. Routing form will be forwarded with sales order acknowledgement. Custom routed product is not returnable. The Country French kitchen exudes warmth and hospitality. Our Reeded Country French Columns add a level of elegance to rustic and shabby chic style kitchens. Available in various heights to support a table, countertop, bar, or kitchen island. The perfect height for a dining table, desk or furniture style vanity. Matching components available in the Country French Collection. Ideal for use with glazed finishes.